Most of us can remember the delight we felt as children on running down a flight of steps, or even better, sliding down an old bannister. As children often know, a staircase is a special thing. It's never just a feature that connects two parts of your home together, a staircase is a visual statement with a feel all of its own. Sure this, ah, well-trodden feature (sorry) experiences heavy use and needs to be extremely sturdy. But this doesn't mean it can't be inspirational. 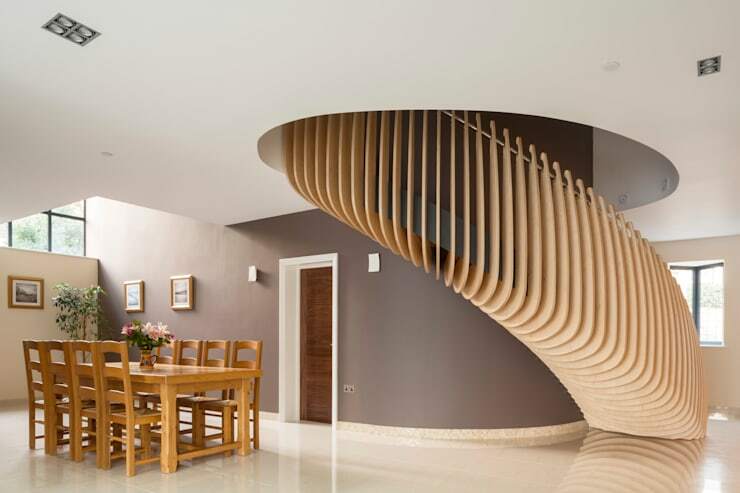 So weather you're planning on a spiral staircase, floating stairs or a traditional old construction, you're sure to find an imaginative or inspiring design for your home. Keep reading and join us to explore some great staircase designs. 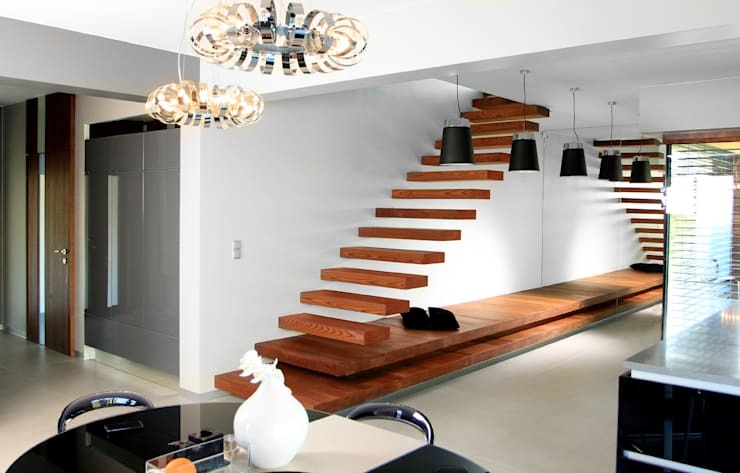 Floating staircases are great for contemporary, minimalist interiors. The absence of a rail creates a light look that really opens up the spaciousness of a room. It may be a safety issue for those with small children, but this risk can be minimised by making the ascension gentle and not steep. What's also great about floating staircases is that they can be used in studio spaces to really open up the living area and create a striking design feature. What a fantastic design and as we said earlier, a staircase is a design statement, and this staircase certainly proves the point! 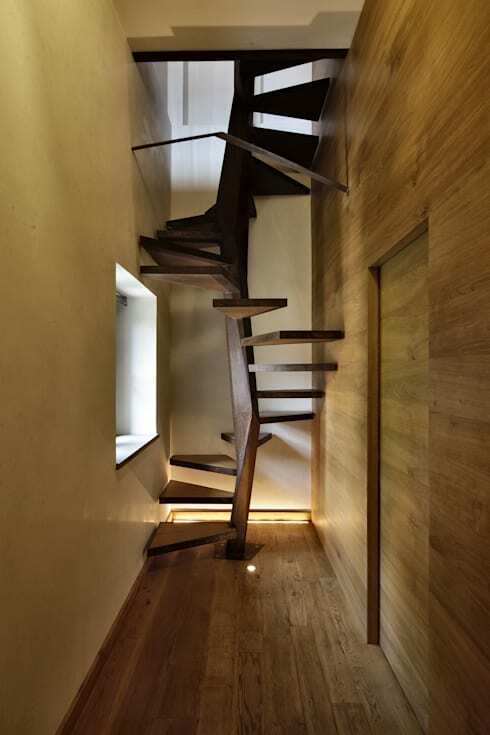 This beautifully curved wooden staircase by Frost Architects resembles a folding fan or set of playing cards. The slightly modulating curve of the bannister is utterly unique and draws the eyes of any observer along its balustrades up and downwards being an art instalation within its own right. Now I'm not so sure I would want to descend this one in a pair of heels. This wooden spiral staircase is gorgeous of course, but the steps would certainly need to have a non-slip surface. Although it doesn't have a bannister, there is actually a lot of support because of how closely it hugs the walls. Such a design is perfect for those tight and smaller spaces where you would need a staircase to reach those upper levels. What is also ingenuous about this design is that it also resembles a tree, so it is as if you are climbing a tree to reach the next floor. How fun! This astonishing spiral staircase was designed by Brazilian architect Escala Arquitetura. With one single sheet of metal forming both the steps and banister, it creates a bold impression. The unashamed flamboyance here perfectly fits the bright, outdoor furniture. 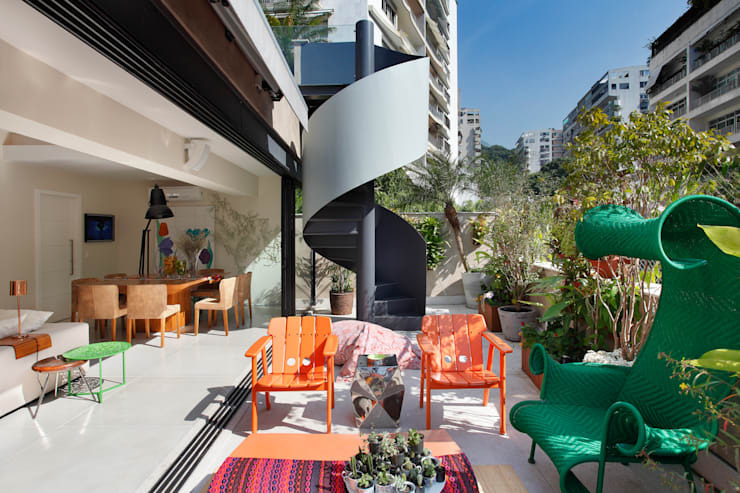 The design of the apartment is abundant in bright and eclectic furniture pieces, so the spiral staircase fits right in and also becomes a design piece, which was incorporated into the interior design. This compact little staircase is a great option for small living spaces. It's such a simple design that we can see a potential DIY project in the works. But this idea can work for all sorts of storage options. A staircase adds an odd shaped space to the average home that can be used for all sorts of innovative storage solutions. For our final photo, we come to a classic stone staircase. 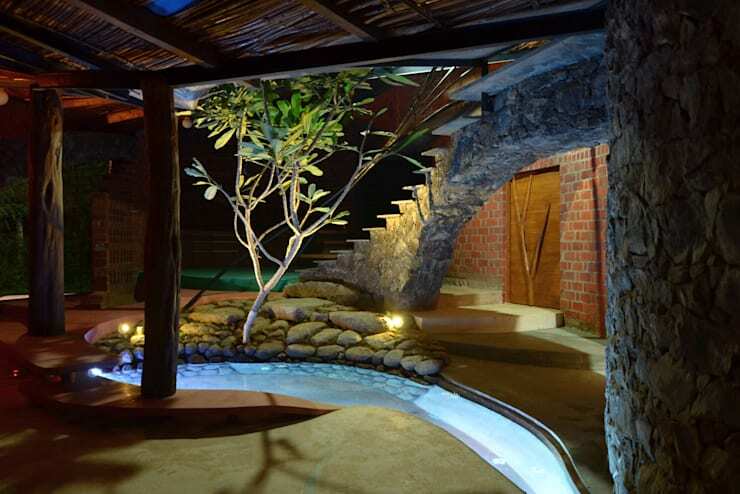 A stone staircase evokes images of ancient folklore, fairy tales and perhaps the Harry Potter series! Check out this original design by iStudioarchitecture. The stone staircase is designed with a curve that forms a graceful arc that blends fantastically with the rest of the outdoor garden. If you are interested in staircase design, you would love this Ideabook Choosing your staircase design. What do you think of these staircase designs? We'd love to hear in the comments below!